Your website is your virtual front door. The vast majority of your potential customers are visiting you online before they decide to visit (or not to visit) your brick and mortar location. Are you making a positive first impression? Are you helping shoppers find what they need and want? Are you presenting the same welcoming, professional environment online that your customers experience in store? Using our scorecard, you can answer these questions and identify opportunities for improvement on your website and in your supporting digital marketing efforts. 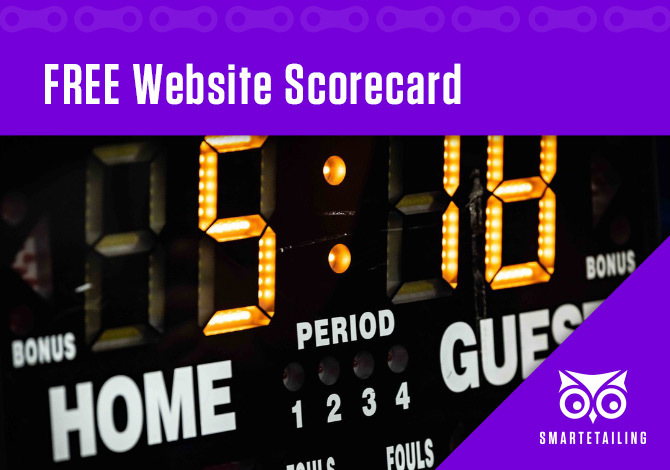 The SmartEtailing Website Scorecard covers seven focus areas, from website setup to SEO best practices to analytics tracking. Within each focus area, we suggest three actionable tasks. If you can already check off each item, that’s fantastic. If not, checking off a few more of these boxes can help you improve your customer’s online experience, making them more likely to visit you again, online or in person. When you were in the early days of opening your bike shop, you understood the importance of laying the proper foundation for your business. You built out your cash wrap, you plugged in your POS, and you placed fixtures and slatwall. Can a customer add product to his or her shopping cart? Are your shipping and in-store pickup options configured? Before you start driving traffic through your virtual front door, it’s critical that you review these settings and others covered on the scorecard to avoid a confusing or an inconsistent shopping experience. Once you have the foundational settings checked off, you can focus on the content and design aspects of your website. Website merchandising is very similar to in-store merchandising - you want to display relevant products and services in a compelling, easy to understand presentation. You’ve made it through the setup and merchandising checklists - now it’s time to drive visitors to your website.